Florence and Mary: Brocante Home's Puttery Treats Challenge - A Re-run! Brocante Home's Puttery Treats Challenge - A Re-run! Back in November 2007 I took part in Brocante Home's Puttery Treats challenge on my first blog Vintage Tea and I thought as I have so many new followers here at Florence & Mary I'd re-post it for you to read! I'd only been blogging a few weeks at this time so you can imagine my joy when Alison shortlisted me!! Sadly I didn't win but it was a real boost for a new blogger, esp as Brocante Home was one of the first blogs I'd came across and was a real inspiration - and of course I LOVE her Puttery Treats! I am pleased to announce that Alison over at Brocante Home has extended the deadline for her Puttery Treats Challenge which means… I can take part!! I have taken the liberty of choosing 3 to write about today but I think they all lend to each other so well I could resist and I hope you agree. Allocate a fabulously snuggly jumper or cardigan as your house jumper. Leave it folded in the basket next to your armchair for long cold nights. Men’s oversized jumpers work best. Go root through his wardrobe now. In kids rooms dig out winter jumpers and hang on their wardrobes as a visual reminder of seasonal change. Change lightweight dressing gowns for snuggly flannel, and tartan jamies and slipper socks. 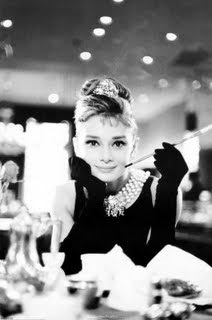 Thankfully Audrey Hepburn is my idol, she decorates my bedroom and her DVD collection is on the book shelf, do I start with Breakfast at Tiffany’s, (Moonriver anyone?) or Sabrina? Want to hear a secret? Once or twice I’ve tried talking like her! Crazy I know but them clipped tones, she just sounds fabulous and elegant, and I want a piece of that! If I have a few hours with no interruption it’s Gone With The Wind….. Rhett Butler might not give a damn but I sure do…. The colours… the clothes…. I could go on and on…..
And of course that brings me to Christmas, last year a friend and I started a new tradition of Christmas film watching over the weekends, Miracle on 34th Street, It’s a Wonderful Life, Santa Claus the Movie and we add a new one each year. She’s just brought Home Alone (although we’re worried about giving her daughter ideas!!) and I’m thinking what my contribution should be – any suggestions? Dig out all the Christmas cds and DVDs you own and put them in a basket near the TV, for impromptu festive viewing…. If I’m honest I’ve already had my Christmas cd playing in the car for the past couple of weeks!!! I love those movies too. My new favorite is Polar Express. Great movie and Tom Hanks to boot. I was watching 'Christmas with the Kranks' the other night on the laptop. I have only watched it a few times, because the bit where Tim Allen has had his botox is so funny that I very nearly wet myself laughing. :O) It's extremely festive. YOu've got all the best already in my view. 'Home Alone 2 Lost in New York' is rather wonderful, as is 'Serendipity', with Kate Beckinsale. And, I love 'Jingle All the Way with Arnie'. It was slated a bit,but I adore it. Especially as it's about a parents quest to get The Toy of The Year! I'm so glad little one isn't too aware of the in toys yet. I don't fancy waiting for hours to get one of those ratty hamster things! Love 'Santa Clause - The Movie' too, it's a classic. I think I remember your Vintage Tea blog, I'm sure I found it a couple of times while out surfing, but I don't think I left a comment. I'll have to take a look. Don't you love reading through your own old blog archives? It's one of my favourite things to do! I'm sad like that! I love that you call jumpers jumpers. Me too. The husband calls them 'jerseys', and I'm always shouting 'that's just a type of fabric'!!! Thanks for your email :O) will reply when I get a mo. We had a lovely anniversary. I walked to Asda with the girl in the a.m, and she talked me into buying some new shoes (I really needed to be talked into it!!!! ), a lovely purple colour, gold trim, extreeeeemely high (but platform sole, so not as bad as they seem at first glance) and very vintage Top Shop looking. All for £15 - bargain! I love Asda! Can't find that gold draped front frock though, surprise surprise, it's sold out already. Shocker!!!!! I hope you and yours are well, Victoria. I dug out all the cds I own last Tuesday when I started decorating my tree..3 long hours, still a W.I.P...and I listened to the New Year's Day's concert too!LOL! Darling have a lovely weekend. Great post!!! And Ican vouch for the PJ love!!! !